This large volume Roberts Spray has been a labour of love for it's owners Dad, a project that was not finished. 'Rosee Jane' is a large volume steel boat that requires completion, the saloon is done but more work is required internally. Most of the boat has the supports in, but needs timber work done. She has a Cummins 80 hp engine that has not been cranked for 8 years. 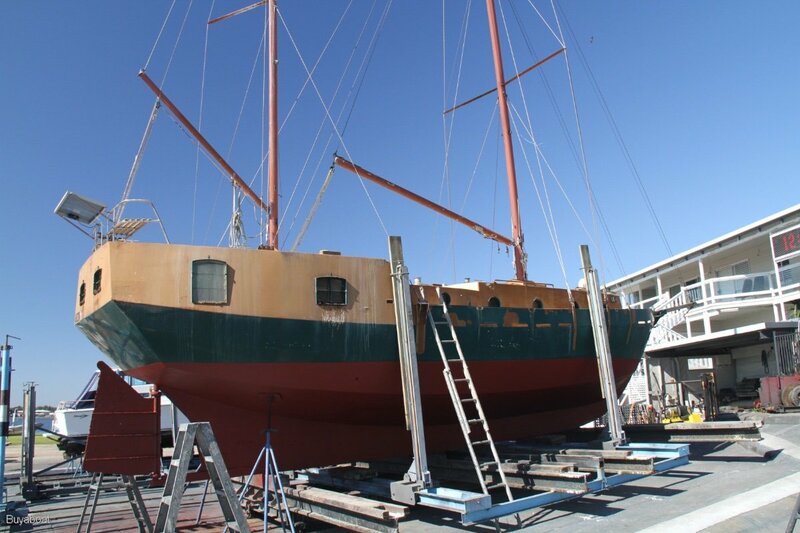 So she is a project that needs finishing, recently slipped and antifouled, the hull is easy to inspect from the inside. Gas stove 2 burners and grill, 12v 40 L fridge, open shelves, galley table seats 4, stainless sink. Gas hot water in galley. Bare bones V berth no furnishings or fitout, Aft cabin large bare bones. Electric with hand basin. Toilet not complete, doesn't work yet. 4 life jackets, 2 fire extinguishers. 12 v halogen lighting, 1 deep cycle battery new, 80 w solar panel. Main 70 - 80 %, Mizzen 70 - 80%, Head sail 60 - 70 %, 2 others unknown. Needs new rope and line. 1 stay on mizzen damaged. This boat is a handy mans dream! If you enjoy working with timber and can fix an engine then this is the project for you, call Glenn on 0414 988 273.